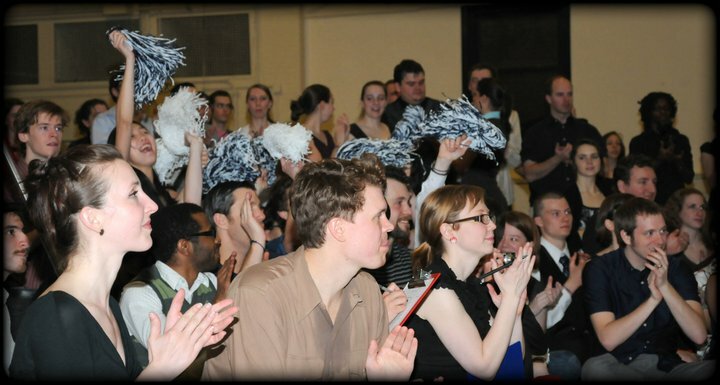 This past weekend was CWRU (Case Western Reserve University) Swing Club’s annual Lindy workshop weekend. As their promotional website promised, SparX did fly at the event. For a college workshop weekend, SparX delivered three tracks (Beginner, Intermediate, Advanced), two bands (Baby Soda & Gene’s Jazz Hot), and two competitions (Jack & Jill and Solo Jazz). Most college events where one is lucky if there is more than one track or live band. Case Western pulled off an impressive feat by having an event this big and well run. After probably the roughest audition I have ever encountered (about 30-40 minutes of straight social dancing, one song after the other), I got placed in the Intermediate track. Generally I thought most of the classes were a good balance of technique & moves to keep everybody interested. However what stuck out to my was Mike Faltesek and Casey Schneider’s classes. I have taken several of their classes, multiple times in the past. What I really enjoy about their classes is, no matter how many times I have taken a class they have offered before, I always get something new out of it. The finals were to live music provided by Baby Soda, the results were..
2:18 Mark Mauthersburgh backing it up with Beth Hartzel in tow. 4:25 Jesse Hanus showing some serious sass. 5:48 Annabel Truesdell shimmying it up. 5:56 Yosseff Mendlesohn & Jesse Hanus hamming it up. Slight Back story to the Jack & Jill: Some of you might wonder why some of the competitors entering the spotlights got extra loud cheering then the others. People actually at SparX were probably wondering who all the crazy people with blue and white pom-poms were. Well one of the Penn State students, (not going to say names) happened to be a season football ticket holder his Sophomore year and saved pom-poms from every game, thought it would be a fun idea to bring the student section to cheer on any Penn State students or alumni competing at SparX. Needless to say, it was a blast for all parties involved. 00:52: Mark’s grand entrance. I am not sure what made the outfit more, the longhorn bull belt buckle or the blue sequin jacket. 9:53: As commented on youtube, Ross Hopkins fall hits a cymbal crash perfectly. Coincidence or crazy musicality? I’ll let you guys decide. 10:20: It’s a shame there isn’t a video from another angle. Jessie Hanus does an amazing Josephine Baker impression here and sells it with her facial expressions. The only negative things I can say about this event would be to trouble shoot the sound equipment with the Friday band a little more and perhaps more food for the late nights. But they were things that paled in comparison to how much ridiculous fun I have been hearing other people claim they had and the marvelous time I had myself. This entry was posted on February 8, 2011 by Apache. It was filed under Dance, Lindy Hop . I appreciate the back story, I was very confused while dancing! But at the end I decided I should bring Annabel to her people! I had such a blast at this event. Classes were excellent, all of my social dances were absolutely fabulous, and the competition was the most fun I’ve had competing, probably ever. Thanks, I’ll add this into the post!